Door, window and porch awnings are popular for homes and businesses. Awnings provide shade, block excess light from entering windows, and keep rain from pouring down above a door or window. In addition to their functional benefits, awnings can also improve the aesthetics of a home or building. There’s no question about the benefits of awnings, but the biggest question that most people have is whether to use fabric or aluminum. Which is best for you? Take a look at the advantages of each below to find out. Fabric awnings are available in a variety of colors, designs and styles. Fabrics are also available from a number of manufacturers, allowing you to find an awning fabric that meets your needs. The many options make it easy to find an awning that will look perfect on your home or business. 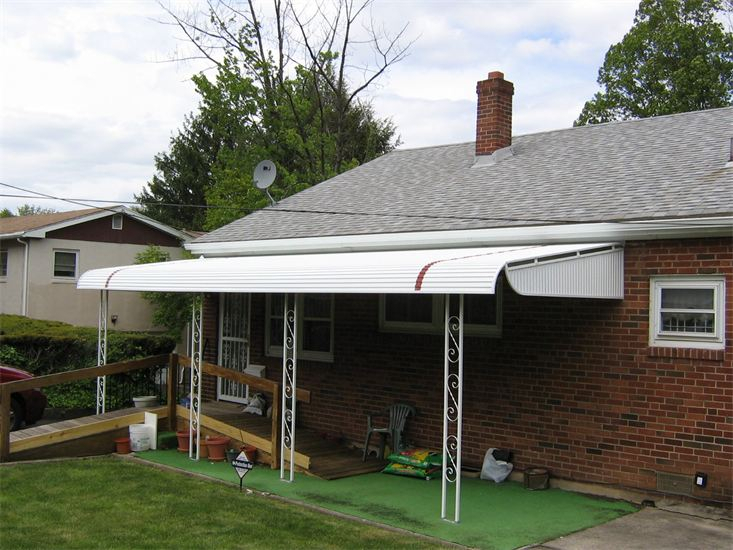 Smaller fabric awnings may be installed without an expensive or complicated frame. This can make it easier and less expensive to have a small fabric awning installed. Fabric awnings wear out, however, and need to be replaced faster than aluminum awnings, but this does provide an opportunity to easily change the look of the building by installing a new fabric design. Since the framework for awnings lasts for a number of years, it is possible to replace just the fabric when it becomes worn, giving you an opportunity to refresh your look more often. Aluminum can be a cost-effective long-term option for awnings. These awnings are often cheaper than fabric awnings when considered over the span of years, depending on the framing requirements. Simply put, aluminum awnings last longer than fabric awnings due to their metal construction. While fabric awnings may last five to 10 years, depending on weather and maintenance, aluminum awnings can last for decades. Plus, as a more permanent fixture, they are designed to be installed and provide not only protection and shade for many years, but through all four seasons, as well. The maintenance work required for aluminum awnings is much easier when compared to fabric. Since fabric often collects water, dirt and other debris, fabric awnings need to be cleaned routinely. Plus, as fabric awnings are not as sturdy, they often need to be taken down during the winter months, adding extra seasonal work and a need for storage during the cold season. JM Finley LLC is your choice for aluminum and fabric awnings. Our professional staff has worked with awnings for businesses and homes for more than three decades, and we can help you choose the right awning for your home or business. Contact us today by calling 610-505-5907 to learn more about our commercial and residential awnings and canopies.